Images for illustrative purposes only. Please refer to product details. Click on the main image for a larger view and to see image descriptions. 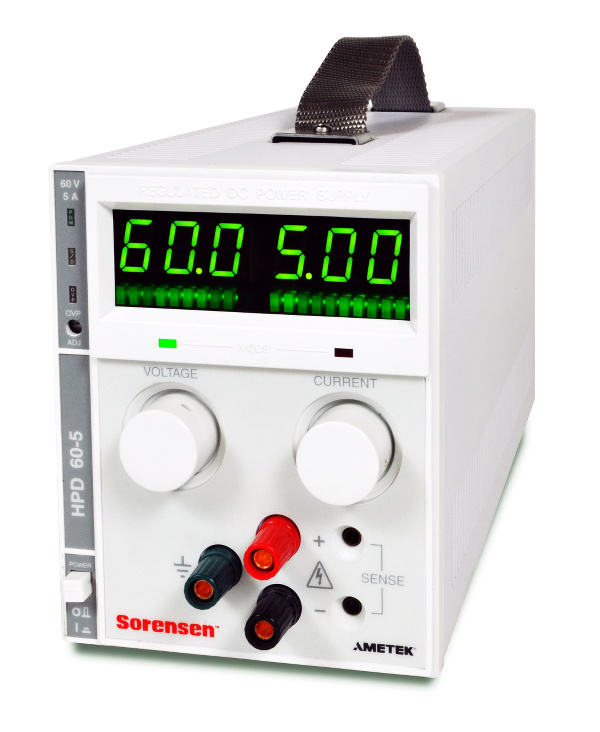 0 - 300W Programmable linear DC power supply in a quarter rack package. HPD uses switch–mode technology combined with linear post regulation to provide performance comparable to an all–linear design. Excellent line and load regulation is matched by low noise and good transient response. HPD is available in singles and duals in a single package for benchtop use. It can be combined in mix and match rack combinations with the quarter–rack 60 watt XT or 500 watt XPD. For systems applications, multiple units can be rack mounted in one to four unit configurations for up to four independent 300–watt outputs. This information is based on manufacturer's data, however it should be noted that some options may be mutually exclusive and may only be applicable to certain variants within a product series. Please refer to the manufacturer's data sheets for clarification or contact us for assistance. This information is based on manufacturer's data, however it should be noted that some accessories may be dependent on additional adaptors or product options, and may be only applicable to certain variants within a product series. Please refer to the manufacturer's data sheets for clarification or contact us for assistance. Sorry, there is no video content linked to this product. Subscribe to our monthly news and offers email.